I had a conversation that went something like this last week. This was in a training session for business owners on how to start off your business on the right foot. Apparently, I’m the only person in Besançon (the city where I live in France) to have created an online teaching business! But it’s not the first time someone’s asked me the “but, how?” question about my online lessons. And I can understand because many people still don’t know how online learning works. I’ve been teaching online for almost a year now. I talk to other online teachers every day in Facebook groups.I sometimes forget that plenty of people haven’t experienced online learning at all either as students or as teachers. 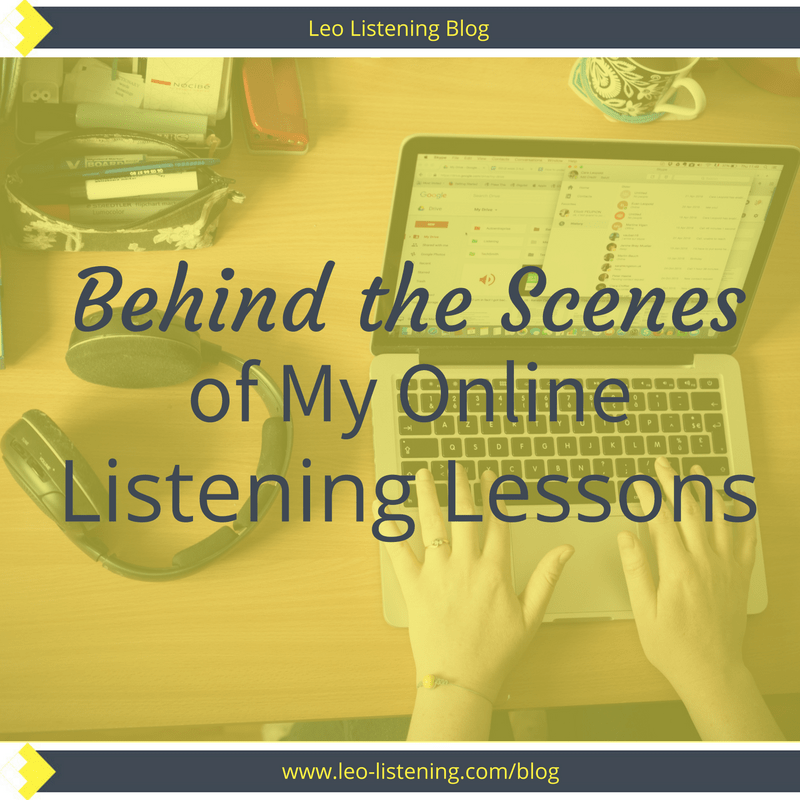 So, today, I’m taking you behind the scenes of my online listening lessons. I’ll show you the 4 main tools I use to help learners like you understand spoken English. First, I have to admit that I adore online teaching. In fact, I prefer it to offline teaching. Why is that? A selection of the many folders full of worksheets from my offline teaching days. All of this is now in my basement and will eventually go in the bin! I’ve also studied in many different ways online. All in all, I’m a huge online learning fan. But today I’m focusing on my own 1:1 online listening lessons. Let me take you behind the scenes. What are my main tools then? Surprise, surprise, number 1 is of course Skype. Skype and online lessons are pretty much synonymous. This is not the only way to teach and learn online, but it’s the most common, especially for language learning. Skype is free to download and install. Let me show you around a little if you’re not familiar with it. This is where you can find your Skype name. I ask my students for their Skype name so I can add them to my contacts. After I can call them, so we can take a lesson together. 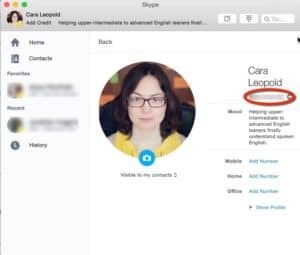 My “Skype name” is circled in red. You can go to this screen by clicking on your name at the top of the window. When you click on “contacts” on the left, you’ll see all of your contacts plus their status (away, offline, online etc). Click on a contact to make a call. Let me show you some cool features that enhance learning so you’re not just spending the session talking! On Skype, you can choose to make audio or video calls. No webcam? No problem. I don’t need to see your face. I have students who prefer to have the webcam off so they can concentrate on my voice. Pretty normal for a listening lesson. In this picture, I’m on an audio call with my brother. To open the chatbox, you just need to click on the speech bubble icon in the top right of the screen. 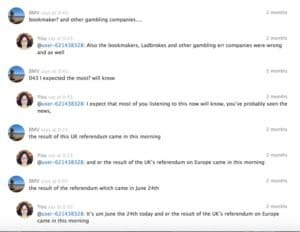 As an online listening teacher I adore the chatbox! If I play or read a sentence, I can ask my students to type what they hear in there. It’s also a great way to share new words and expressions. In my premium lessons, I take all the new words from the session and record them to create an audio vocabulary book for my students. The chatbox is also a lifesaver in case of communication breakdown. I can simply type instructions, instead of saying them. 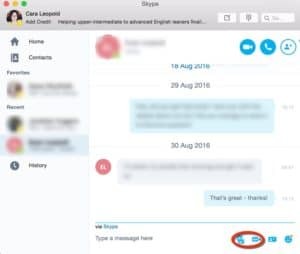 An example of the chatbox on Skype. Here, my brother and I are sending each other instant messages, without calling each other. Very practical when he’s at work! This is another feature I love. I click on this button when I want to share my entire screen with my student. This could be to show them a presentation or an image. My students can also use it to show me if they’re having problems connecting to a resource. It’s also a way to watch a video with a student. Click on the ‘plus’ button whenever you want to share your screen. You can do this in an audio or video call. 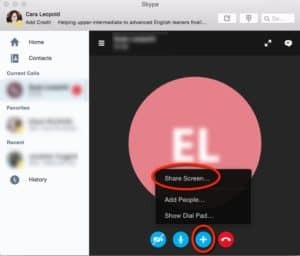 It’s easy for me to share files with my students on Skype and vice-versa. You simply drag the file you want to share into the chatbox and then press enter. You can also click on the icons. I do this when I want my students to look at a particular image or click on a link. Either drag and drop a file into the chatbox or click on the icons to open the documents folder on your computer and choose a file to share. I absolutely love Google Drive. Have you used it before? It’s part of the Google suite of tools like Gmail or YouTube. 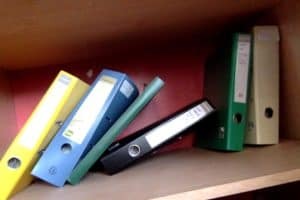 It’s a way to create and store different documents in the cloud, so you can access them from anywhere. If you have a Gmail account, then you automatically have access to Google Drive. Why is it an indispensable online teaching too? Well, I can share documents easily with my students and we can collaborate on them together. Once I or the student have shared a document, we can both write in it at the same time! How cool is that? Once I’ve prepared the lesson for my student, I click on share to send them the link so they can do the listening work outside of class to prepare. When you work with me to understand spoken English, I give you some audio or video to listen to before our lesson, along with some exercises. I put the links and the exercises into a Google document and the share it with my students in Classmill (more on that in a second). I can then check that my students have done the homework before the lesson because I can see their answers in the document and make comments or corrections as necessary. If they haven’t done the listening before class, I can also make other plans. On the right, you can see the comments I’ve added to my student’s work before the lesson. It’s a tool that I couldn’t live without! 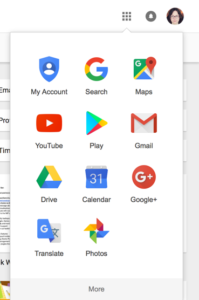 Other useful tools for teaching and learning in the Drive suite are Google Slides (share a presentation with each other) and Google Forms (create questionnaires/quizzes). I’ve used Google Forms to create a Needs Analysis for my students to fill out for instance. This is a resource I discovered thanks to fellow online teacher, Emma Segev and so far I’ve found it handy for keeping everything together: homework, links, videos, audio, worksheets, feedback and so on. It’s a great way to remind myself and my learner about what we’ve talked about so far. You can easily go back and look at resources from previous weeks, re-do exercises, share extra resources and all sorts of useful things. I create a Classmill “class” for each student. The “modules” correspond to lessons. This is what each module or lesson looks like on the inside. I add feedback plus links to Soundcloud, Google Drive links, YouTube videos etc. Each student has access to their materials via a password or in the case of a group class, you can invite several people to join. I also find setting homework through this system really practical. That’s a really important part of my lessons because learners working with me have homework to do prior to each lesson. I know that sounds a bit school like but this lets you do the listening at your own pace before the lesson. We then spend the class time going over what you understood or more importantly, what you didn’t understand. That’s where the learning actually happens! Soundcloud is a platform for hosting and sharing sounds. This could be music, podcasts, or even audiobooks. If it’s in audio format, it’s probably on there. This is where I host (that’s just a fancy name for store) Cara’s Fast Natural English podcast and it’s also a great platform for listening and speaking practice. 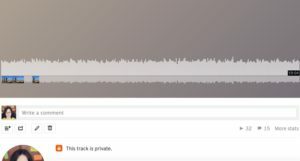 Inspired by Tyson’s article, I’ve used Soundcloud to upload private tracks (watch me do this in this vid) so that students can leave comments as dictations or reactions to the track (I show you how to do that in this video). Clearly, if you’re going to do this, make sure that the you respect the track’s copyright. Souncloud displays recordings as a wave. You click on the wave where you want to leave a comment, or in this case write what you hear i.e. do a dictation exercise to test and develop your listening skills. Under the wave, I can see what my student has transcribed. I then add my corrections and take note of what they found difficult (new vocabulary, weak forms, squashed expressions, difficult accent etc). I publish my podcasts under a creative commons licence so you can upload them privately and practise your listening skills with them. 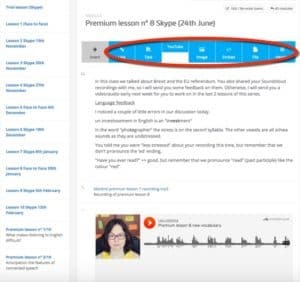 Soundcloud is also a fantastic tool for speaking practice for both teacher and learner. I ask my students to make recordings as a follow-up to listening. This could be a shadow reading from the audio to work on pronunciation and listening (learn more about shadow reading in my e-guide). Or a personal reaction based on the topic of the listening. After, my students upload this track privately and share it with me. I can then go back and add corrections as comments. I love this system. Remember I told you that I record new words and expressions for my students? Soundcloud is also where I upload and share those recordings as private tracks. However, this year, I’m moving to a new system: Memrise, so I can create audio vocabulary courses for my learners. Expect a blog post from me soon about why and how you should create your own audio vocabulary book. You might be interested in the series of videos I’ve made on YouTube about using Soundcloud to understand spoken English. This is a tool I learned from Olya Sergeeva. You can copy and paste transcripts into wordclouds as a way to predict what the listening will be about or to check any difficult vocabulary before listening. I also encourage my students to make wordclouds before they listen when they work independently. There are a few different sites where you can do this. 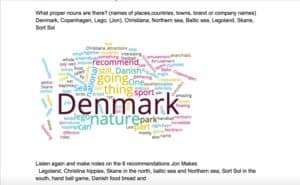 My favourite is www.wordclouds.com. I’ve written about this here and I’ve even made a video to show you how to find and use them on YouTube. Edpuzzle is one of many sites where you can add questions or activities to a video. Others include Ted-ed or Blendspace. I’ve used Evernote before to create a book for a student based on our lessons, including audio. Now, I mostly use it for making my own notes after lessons for each student (thanks to Chris Rush from Better Business English for this idea). That’s the end of the behind the scenes tour. Thank you for joining me! What do you think now you’ve been behind the scenes of my online listening lessons? Do you agree? Do you have experiences of learning online? Would you like to understand spoken English in this way? I’m looking forward to hearing your ideas in the comments. Hello Cara, thank you for the insight into how you do it. 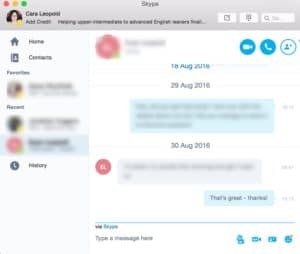 I still use Skype but I prefer Zoom which is free for 1 to 1s. I link up with the student on Skype and then send them the zoom room number. 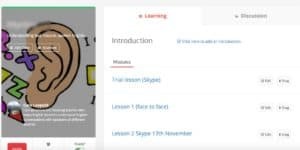 It is also very easy to record in Zoom, I give the student record rights and tell them so they can record the lesson if they wish – saves clogging up my HDD with recordings. Classmill looks like a brilliant resource that I intend to look into more. If students can see what they have done it demonstrates the progress they are making and as you say they can always go back and review lessons/exercises from one place rather than a collection of emails. Hi Bob, thanks for your comment. Yes, I’ve heard good things about Zoom and I’ve used it many times with Elena before, but just not with my own students. It’s definitely a tool I want to learn more about moving forward. My workaround now for recording sessions is Ecamm Call Recorder, but it’s true that it’s even more practical with Zoom. I didn’t realise students could record the session in Zoom – that’s a really handy feature. 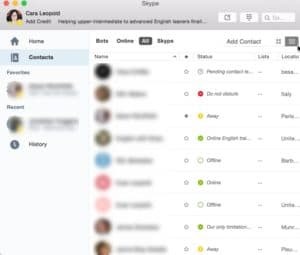 Classmill is great as a progress tracker, plus the students have all the material to go back to once the classes are over. It’s also great for setting homework. You can create a “module” called homework so that they know exactly what to do. That said, I’m considering simplifying my systems but just using a Google Drive folder or even by putting the material on a password protected page on my site. Thanks for the mention of my post. It’s nice to see it have a continued life. Could you correct my name? 🙂 Best of luck to you! Good – it’s a great post. Sorry about your name. I’ll fix that! What a fantastic post! I’m going to share it with teachers, too. Thank you! P.S. And thanks for the shout out. I find your tips really useful, thanks for sharing. I’ve been teaching online for 2 years now and I believe it’s great to share and read about other teachers’ experiences and tools used for a better and more productive teaching. I’ve never heard about Classmill before but I’ll definitely explore it now. Hi Danubia. Thanks. I’m glad the article was useful. Not many people seem to know about Classmill, but I’ve definitely found it helpful. Hi Lisa. That’s great. Really the technical side is not complicated as you’ve seen from my post – what’s much more tricky is actually building your online teaching into a business that serves the students you want to work with! The groups I’m part of on Facebook are Opted Out, run by Elena Mutonono and Savvy Online Teacher Marketing, run by Kerstin Cable from Fluent Language. I’m sure you’ll enjoy both!